You have been invited to this event by the Culturally-adapted Family Intervention (CaFI) research team. CaFI is a National Institute for Health Research (NIHR) funded, 54 month project starting in April 2019. It aims to test a new form of talking therapy with African & Caribbean families affected by schizophrenia. The study will take place in six NHS Trusts in England, including South London & Maudsley in London. The other locations include Manchester, Merseyside, Birmingham & Solihull, Coventry and Southampton. Before we can start to test CaFI (the therapy), we want to ensure that the therapy materials, including therapist training, are acceptable to African & Caribbean families. We have already done this with Caribbean families, who all liked CaFI very much. Next, we want to work with Sub-Saharan African service users, their family members and carers, and mental health professionals who have experience of working with Sub-Saharan service users/families. This is where 3rd sector organisations come in. We would love to establish links with organisations who work with African service users and/or their families and carers to work with us. 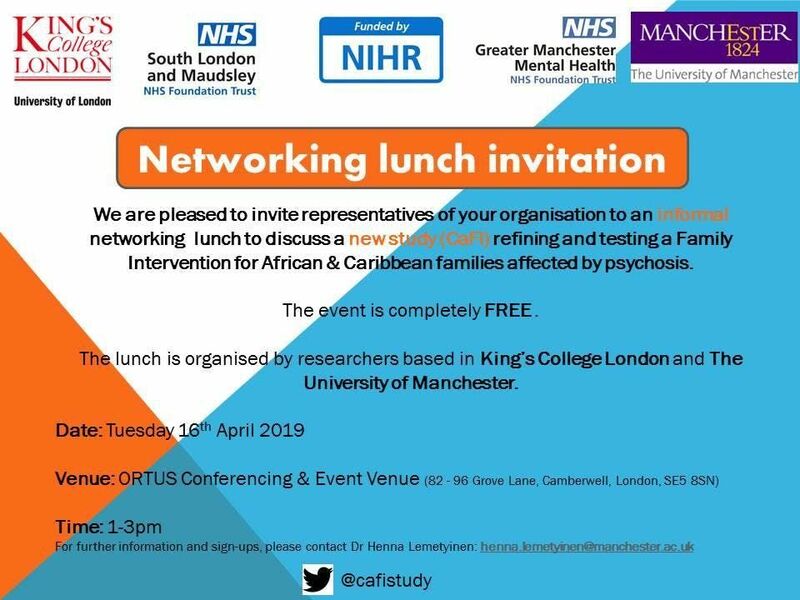 Thus, it would be fantastic if representatives from organisations working with African service users and/or carers could come to this free networking lunch, where you could meet our London Lead Research, Dr Claire Henderson, and the Lead Researcher of the entire study, Dr Dawn Edge. If you would like further information, please do not hesitate to contact Research Associate Dr Henna Lemetyinen: henna ! lemetyinen | manchester ! ac ! uk.